We hope you enjoy visiting this site and reading all about our stars and the efforts to raise money for Greyhound Adoption. Feel free to browse our site, join in, and contact us if you have any questions. We currently have FIVE active participating greyhounds around the country raising money for greyhound adoption, thanks to the generosity of their owners. To read more about the adoption groups who benefit, click here. We are pleased to announce two new hounds to the RFA line-up. Hudson Brawl (EM's Mac Attack x KL's Macy), a white and blue brindle male, has been donated by breeder Herbie Legg Jr to adoption group New Mexico Greyhound Connection. He is currently schooling at Mile High. At Palm Beach, Fish N Chicks (Pacific Mile x Melissa May) will be running to benefit Greyhound Adoption of Ohio. She is owned by Lori & Randy Doubles. A big thank-you to Herbie, Lori and Randy for this generous gesture and we wish the new pups well! Do you have a greyhound you would like to participate in RaceForAdoption? Visit our FAQ for Owners page to learn more, and how to contact us. 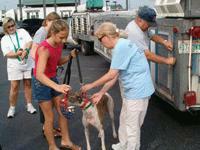 RFA funds have enabled SEGA to haul more dogs from JCKC, FL into adoption groups. Click the logo to learn more about GRA/America!